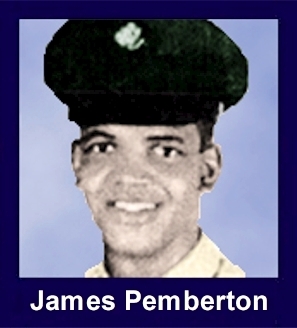 The 35th Infantry Regiment Association salutes our fallen brother, PFC James Alexander Pemberton, who died in the service of his country on April 5th, 1968 in Kontum Province, Vietnam. The cause of death was listed as Small Arms/AW. At the time of his death James was 22 years of age. He was from Beckley, West Virginia. James is honored on the Vietnam Veterans Memorial at Panel 48E, Line 19. The decorations earned by PFC James Alexander Pemberton include: the Combat Medical Badge, the Bronze Star with V, the Purple Heart, the National Defense Service Medal, the Vietnam Service Medal, the Vietnam Campaign Medal and the Vietnam Cross of Gallantry with Palm Unit Citation. On April 5 1968, Specialist Five Pemberton, was attached to Company A, 1/35th conducting a search and destroy operation near Kontum City. As the unit cautiously moved through dense jungle undergrowth toward a known enemy location, it was subjected to an intense barrage of hostile fire. In the initial volley, several men were injured. Despite the intense hostile fire, Specialist Five Pemberton rushed forward to administer first aid to the injured. Moving from one position to another through the hostile fire, Specialist Five Pemberton calmly administered first-aid and offered words of encouragement. As he again exposed himself to reach still another injured man, he was mortally wounded by the intense hostile fire. His courageous determination clearly prevented more serious casualties and greatly aided and inspired his comrades in successfully defeating the hostile assault. Specialist Five Pemberton's exceptional courage, preserving concern for the welfare of his comrades, and exemplary devotion to duty are in keeping with the highest traditions of the military service and reflect great credit upon himself, his unit, and the United States Army.